What is the correct water temperature for brewing coffee? Boiling water from the kettle. Now wait a little before brewing. When I make coffee with my drip brewer, it heats up the water and, I guess, it's at the right temperature when it brews the coffee. But what about when I use my French press? Someone told me I should never pour boiling water on coffee. Is that true? The ideal temperature for brewing coffee is 200 Degrees Fahrenheit. That said, don't get overly concerned about hitting the exact right temperature. Drip brewers have their own thermostats, and some even offer you a choice of more than one brewing temperature. Why they do that is a bit of a mystery. Perhaps they are trying to appeal to people who don't want their coffee too hot. If you are boiling water for use in a French press, bring the water to a boil and then leave it to rest for a minute before pouring in onto the coffee grinds. Again, whether you wait for a full minute or you get impatient and pour the water after thirty seconds, don't worry about it. A few degrees difference won't spoil your coffee. Comments for What is the correct water temperature for brewing coffee? Water boils at 212(Dg-Fh/at sea levle)which is enough to disrupt the flavor. The more Hot the water, the more bitter the oil will be as it scorches or turns the oils. In saying that the waters job is to distill the oils and flavor from the ground bean, but as I said above hotter water more bitter the oil. The cook of the bean itself plays larger role. Beans are roasted at different temps and for different time periods as to make the bean brown or blacker. This effects the bean brew flavor and essential bitterness as the oil is in the bean to begin with and before it even reaches the coffee pot. The coffee bean (oil) bitters with each increase in temp/time to the roast,so the blacker (most time) the more bitter and stronger the flavor. Likewise it is distilled as the water runs over it, so even the water may change the roasted oil if the water is too hot. Many of the auto drips perk up 12-20 degrees too hot as that is the mechanics to pump water up hill and will actually scorch the bean and distilled oil...no matter how its final temp is determined in the cup. Its like frying bacon, if the heat is too hot the bacon will burn before it cooks....that simple! Thus the reason java freaks like 15 bar pumps, french press and temp controls...so they can play with the temp of the brew a little. If 12-20 degrees does not seem to be too important to you then there is not much use in being in this discussion. The bottom line, you have to play around with the roast (and find one that suits your taste) as that will first determine the bitterness more so, then the water temp will also play a role in extracting the bitterness; and the temp of the water may influence the bitterness of the oil. After reading dozens of posts I am amazed that no one has mentioned the need to stir the grounds as they are saturated with water. After talking to a few experts and amateurs. This is a key step in order to get full extraction and full flavor. Pour the water Onto the beans, pause and stir. You can even do this with an automatic coffee maker with cone filter. I've been using a Melitta pour over (a term I learned here) for years. They used to say 180-200 d., now it's higher but I haven't changed. I use an instant read thermometer, Brita filtered water and (the squeamish, stop reading) make around 8 medium sized mugs at a time. I fill 4 or so mugs and leave the rest in the glass carafe, after mixing it all in a large pitcher (as it takes a few fills to get that much). I cover the mugs with plastic wrap and leave all in the refrig. I just don't want to be bothered making coffee all the time. Each day I heat a mug or maybe 2 in the microwave for around 2.5 min. so each cup is only reheated one time. Using Melita filters, I feel confident that there are little to no coffee particles left to keep brewing (hold the glass up to the light and you will see no particles settled on the bottom). And yes, I do grind the beans each time I make coffee - with a bladed grinder that makes very even grounds. The Bunn coffee machines are good for satisfying the majority of consumer's taste for coffee. This accomplishment is a result of the design of the machine. The coffee in a Bunn is brewed at a slightly hotter temperature than that which is in the pot. The thermostat is on the water tank and the water cools to the desired drinking temperature during the brewing process. These machines do not have a vacation setting, and are designed for daily use. If coffee making is reduced to 3 day or more intervals then some of the water will evaporate out of the tank. The newer Bunn machines have a water level board which will add water when this occurs. Filters remove minerals and purify water at the micron level, thus helping the coffee taste better. Why are the last few letters of text clipped off in the comments section here? ...very annoying ! Editor's Note: I'll look into it. Thanks for the heads-up. Almost all coffee is brewed with the water tmperature way too hot - at the 200 degree myth! This brings out way too much bitterness and destroys the taste of most coffee. For pour over the perfect temperature is between 170-180 (max!). For smooth, rich tasting cup of pour over, try it. You'll love it Pre-heat your cup as noted by others below. There is a lot more than just the water temperature. Bunn Omatic brewer. We bought a used Bunn over 10 years ago on Ebay. With some new electronics and cleaning, it makes consistently great coffee. Hooked to the house water with an inline filter it makes 12 cups in under 4 minutes. Grind, place in filter and flip the switch. It's the best flavor and easiest to use. Hario Sihpon - We love this but it does take a lot of effort compared to every other method. for flavor it gets the number two slot. We use this with other couples over for dinner, it is great theatre and equally great coffee. French Press - Simplicity is number three compared to the Bunn and the Krupps and for flavor it also holds the number three spot. Pour over drip coffee maker. Not as good as the others but makes ok coffee in 12 cup lots at the table. Krupps automatic drip coffee maker. It looks like this is terrible being last but it's not that bad. It's the second easiest to use and makes ok coffee, like all drip coffee makers, it does an ok job of making coffee and is the second easiest next to the Bunn. These also take a lot longer to make a pot of java and the "sneak a cup" features should not be used as they take away from the early part of the pot and these coffee makers are best when the whole pot is made to combine first before serving. Other things, we roast our own beans and use a mill grinder at home and each method requires something different from the roast and the grinder but it is fun to find those sweet spots. I've been experimenting with water temps for a few months. I've been using a #6 or a #2 Melitta filter and a pretty generous amt of coffee. I'm finding that pouring my brewing water into the cone at 180 degrees results in a very smooth coffee. I have to preheat my coffee mug to keep the coffee hot enough. No problem as the taste is worth it. I wonder if anyone else can comment on their experience? The usual coffee water temp advice is 200 degrees or so, but I think that may be questioned. Since we moved to Colorado from Cape Cod (from sea level to high altitude) my drip coffee maker doesn't get the water hot enough, only to about 160-165 F. At first I thought the coffee maker was broken, and started using my French press that I keep as a back up. However, that is not my favorite method to make coffee, as I find it a bit oily. Today I bought another drip coffee maker, only to find the water still did not get above 160. Then it dawned on me that water boils at a lower temperature at high altitude and perhaps this is the problem with the coffee makers. I don't enjoy luke-warm coffee. I am considering boiling the water first and then running it through the coffee maker, but don't know if this will damage it. Any suggestions? We had been using a Bunn Pro drip coffee maker to make the water hot for our French Press (it was $80 on eBay versus $200 for the under the sink item, about ten years ago) and it finally fell apart this week. Same beans, grind, etc...water temperature makes a *huge* difference. I never knew...have to let it boil and cool down for more than five minutes or take off burner as it starts to 'rumble' and wait to cool down at least four minutes. Therefore nearly all coffee makers actually heat the water to same temperature. If it doesnt boil, it wont go up in the pipes! i have been exprimenting with my yama stove top siphon. The ideal temp profile seems to be, 197F when i put in the coffee. The temperature rises onces the coffee is in the top vessel, so i wait till i know that 197 is the stable temp, (its not on a rising trajectory). As soon as i put in the coffee, i turn the stove down lower, but not to the lowest. (am using a gas stove). 15-30 seconds later the coffee starts to drip and has completely dripped by 1.5 minutes. This protocol is optimized for light-medium roast yirgacheffe and panama esmeralda. Cone on cup with paper filter, 1/4 cup fine ground coffee, hot water dispenser at sink 190 deg. cover coffee, wait 2 min. cover again until cup is full. Black only. I've used a range of methods to produce a cup of coffee. They include stove-top percolator, electric-automatic drip filter machine, cafetiere or french press, and others. I have also used a Groundhog filter/filter basket directly in a glass jug and poured water through it. - for drip coffee makers, the time that the coffee spends in the pot, being kept warm, before you pour it to drink. You'll find many different permutations being recommended, because we each have different needs and taste. So don't get tied into a ritual of leaving 150mg of coffee in 96 degree Celsius Evian water for 3.65 minutes before drinking 8.75 fluid ounces of the stuff topped off with 3 fluid ounces of goat milk, no sweetener. Experiment with different things. Experience the range of tastes. And don't shun instant coffee, when you need a quick fix, unless you choose to not. Don't let anybody tell you the best way to make your coffee. 1) Variations in coffee estate. 4) Most importantly, personal preference. I'm a coffee snob, but I doubt I like my coffee the same as many other coffee snobs. I am a "supertaster", which is pretty much a bad thing. Bitter things make me cringe. If I need sugar or cream (or sugar AND cream) I won't be having a second cup. Since about 25% of the population are supertasters, 25% ARE "non-tasters" and 50% are "normal" tasters, you're not going to find a lot of agreement on something with such a complex taste as coffee. I think french press tastes atrocious. I used to think it was an affected frou-frou device for the ostentatious. (although I have one in my cabinet, along with a vacuum brewer). However as I got older I understood it was just a method for people to try and achieve the perfect cup, so go for it. I use about a tablespoon and a half of fresh ground (instead of the "standard" two) and every time I use a new roast or estate I have to play with the temperature of my water, often as low as 180°F, to find what I consider pleasing. YOUR perfect cup of coffee is worth searching for too, so play with the temperature! I used my trusty cooking thermometer to test how fast the temperature falls after boiling a pot of water. I used a stainless steel 2-quart pot for the test. First, very interesting that the water will start to boil around 205 degrees. Letting it get to a full boil after another 30 seconds or so brings it to 210-212 degrees, depending on your barometric pressure of your local weather. Mine is typically 210 degrees and I live in Fairfax, VA. However, once removing from the burner, the temperature falls quickly. After only 20 seconds, it was down to 207 degrees, and 30 seconds for 204 degrees. Waiting two minutes reduces the temperature to 180 degrees. So, from my experiment, 30 seconds is about perfect and 2 minutes it too long. Note that I removed the pot from the burner....if you leave the pot on the burner and just turn off the heat, the water temperature would fall more slowly. I didn't test that scenario. I have found that the best tasting coffee is the Tanzanian Peaberry at Barnies. Always start with whole bean coffee as coffee starts to lose flavor almost imediately once its ground. In culinary school, we were taught that 205 degrees is the perfect temp for brewing coffee, as it allows the water to get all the flavor out of the bean without burning it. Never use boiling water, and never use water that has been previously boiled, as boiling releases a lot of the oxygen from the water, and it will brew a flat cup of coffee. Filtered water is best to use as it removes chlorine from the water. Always immediately pour your coffee into a preheated pump thermos. Do not allow it to sit on a heating plate and never reheat the coffee. If you must reheat, the microwave is the best method for that as long as you do not leave it in there for more than 45 seconds. And for the best flavor in your coffee, add just a pinch of salt to the coffee grounds before brewing, as the chemical action of salt brings out the flavor to its maximum. It will not taste salty. Remember, just a pinch. will cool to 185, even with a preheated french press and a tea cozy. so starting a little hotter, say 204 is probably better. "a few degrees difference won't spoil your coffee"
Everyone who is saying that the water temperature needs to be EXACTLY 92 to 96 degrees celcius and shouting for the author to correct his statement that "a few degrees difference won't spoil your coffee," should just relax. The difference between 92 and 96 is a few degrees! The difference between the boiling point of water (212 degrees F) and letting boiling water sit a minute or two off the heat to cool down will most likely fall into this 4 degree margin. Just make sure your thermometer is calibrated, or you never know if the temperature you're measuring is correct or not. 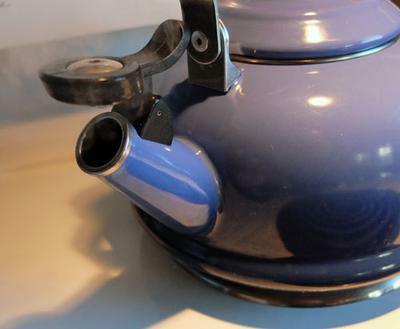 To calibrate a dial-display thermometer, bring a pot of water to a boil. Insert the tip of the thermometer. It should read 212 F. If it doesn't, adjust the dial until it does. If you are brewing too hot, you risk the chance of scortching the beans (at the worst) or just evaporating a lot of coffee aroma (at the least). In the latter case, your house will smell wonderful, but your coffee will smell and taste flat. As far as serving temperature goes, I think that coffee should be served immediately after brewing. So it should still be pretty close to the original brewing temperature. Do not hold coffee on the heat for extended periods of time. As soon as it is brewed, it starts to lose its aroma and taste. Brew in small batches if you're going to be serving throughout the morning/evening. Or maybe invest in an airpot, which will keep the coffee as hot as possible for as long as possible while preventing the evaporation of those lovely aromatic oils. Anyone who has camped or used a percolator will dispute this. The water needs to be boiling and should continue to boil for a little while when making coffee. Coffee made with too low a temperature is awful. 9. Use fresh, premium coffee beans. The Capresso T 455, combination grinder and drip coffee machine has been mentioned to me several times as the best choice for home use. it features a burr grinder, supposed to be the best, it features a resevoir for your beans, so you don't have to measure the beans everytime, and it heats the water to 200F which is by most opinions the best temp to brew coffee. And it costs from $169-$200 depending on where you buy it. I'm new to drinking coffee, have been basically a tea drinker, but now coffee in the afternoon. One thing I do notice is alot of difference in tast, so far I have found that grinding your own beans makes a better cup of coffee. Now to determine the best beans, it's gonna take awhile. Of the five types I've tried, Dunkin Donuts original blend have been the smoothest so far, with an excellent aftertaste. 8. Gevalia coffee is CRAP. I have just purchased a drip brewing coffee machine,this machine keeps on producing coffee that tastes burnt.Can anybody help me as to why? I replaced a Mr Coffee auto drip coffee maker with a new one and have not had a good cup of coffee with the new pot. I have tried adding a few more beans of a bold brew and have even changed to an extra bold brew but still get almost no flavor. I shouldn't have to increase the contents or change to a bolder flavor, so I'm wondering if the temperature of the water running through is not hot enough. Can someone help or give me a few suggestions? From what I understand, the Technivorm Electric Drip Coffee Brewer is the only electric drip coffee brewer that heats the water to a proper 200º F. Sweetmarias sells them. The downside is the cost?$245 and $265. Another option is a French Press and a variable temperature electric kettle such as the Chef Choice 688 Smart Kettle or Breville BKE820XL Variable Temperature Kettle. And a low-cost single cup brewer solution is described on this website. I still enjoy using the old perculator type on the stove. Best coffee and aroma although you do need to watch the temp does not get to hot. What coffeemaker does keep the hottest coffee? I have purchased the cuisinart w/ hot plate temperature control and it's still not very hot. I agree, temperature is important. Yes, a few degrees might not make a difference, but does a $20 coffee machine get to the 200 degree point? I think the original author meant that getting the temp EXACTLY 200 degrees F, (93.5 Celsius) is not vital. A few degrees off doesn't matter, as with the range you stated. When you say not to worry about if the temperature is not the right one when brewing coffee, you are contributing greatly to the making of a big mistake! Water temperature in brewing a great cup of coffee is VITAL. It has to be between 92 and 96 celsius degrees! No more or no less. When you dismiss this fact so lightly you show how little you know about coffee brewing! Please correct this serious mistake! What is the proper serving temperature for coffee? Good question. I fear not. It's beautifully simple and is made from metal and glass only. Return to Coffee Questions Archive 2007.